I am a Korean, 100% inside and out, but I hardly watch Korean dramas nor listen to K-pop. I guess I must be a mutant or something. Well…, I just don’t have time and patience to sit and watch 50+ episodes of much complicated human relationship. Then, one day about 3 years ago my sister, who is another mutant in the family, told me about a drama called “Daejanggum (a jewel in palace)” and said I must watch that since I am a foodie. It is about a palace girl in an olden time in Korea who was a cook, then became a first female doctor to the king. The drama was made over 10 years ago and became a huge hit all over in Asia. I finished the entire 54 episodes (which is very unusual) not only because of the great story line, but also the many interesting palace foods that I’ve never heard of. This recipe is one of them. It’s called “Mac-jeok (맥적)”. 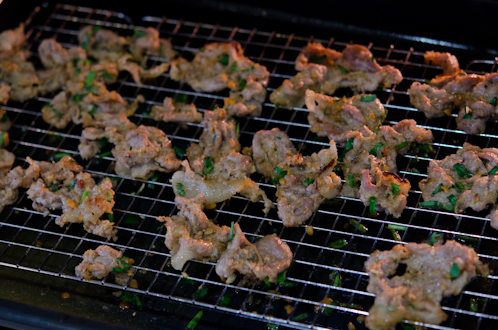 It is grilled pork coated with “doenjang (soy bean paste)” sauce. 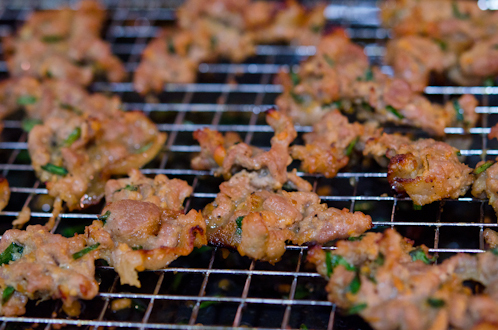 Mac-jeok was the original form of Bulgogi according to the Korean food history. Somehow people, except a few, had forgotten about the dish for a several hundred years. 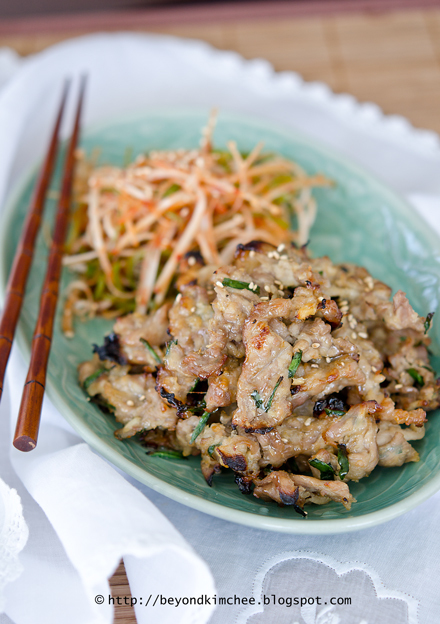 Now the secret is out and many Koreans make this divine pork in their home. The taste? Out of this world! My husband, a serious food critic and not so much of pork-lover, complimented. You would think a dish served to the king will be quite difficult or complicated to make but this is NOT. It is amazingly easy and quick to make. Unlike Bulgogi, which requires many hours of marinating, this royal pork can be cooked right away. It is a winner of all Korean pork. Who knew a pig can return to the palace with a crown on his head? This is the pork cut I used. 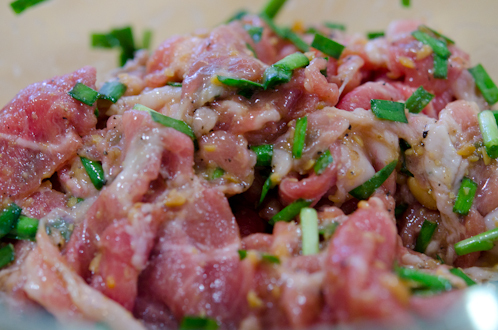 It is thinly sliced pork neck meat called, “mokssal”. You can find this paper thin pork slices as frozen in Korean grocery stores. 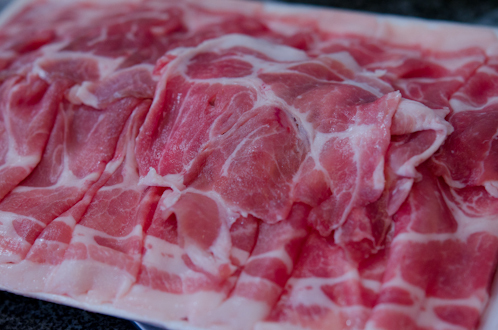 Here is a 30 second lesson on the marbling in pork. Unlike beef you won’t find any marbling in pork cuts. You only see a thick layer fat attached to the side that you can slice off. No offense but pigs simply have too much fat. However, there is only one part of pig that has some marbling in. It is on between the neck and shoulder. Very tender and juicy, it is perfect to grill or broil. If samgyupssal (Korean pork belly) was more for the commoners, this mokssal was for the royals. Now you understand why this cut was served to the king. I used very thinly sliced cuts for this recipe but you can use thicker slices (up to 1cm). The royal ingredients of this recipe! Pork, Asian chives, doenjang paste, rice wine, Korean corn syrup, Korean soy sauce for soup, pepper, sesame oil, and sugar. 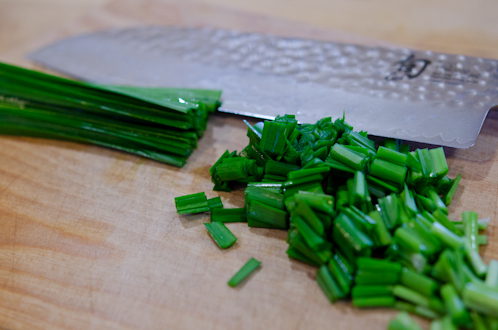 Chop up your Asian chives or green onion. 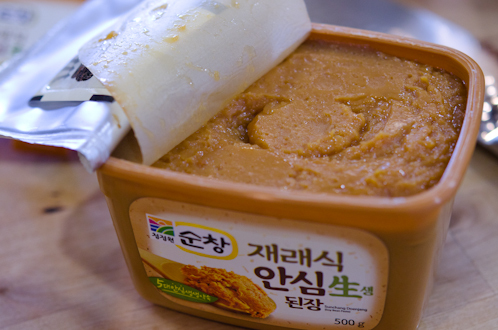 Here is doenjang paste made of fermented soybeans. Very earthy! Mix doenjang and all the rest of the ingredients in a large mixing bowl. 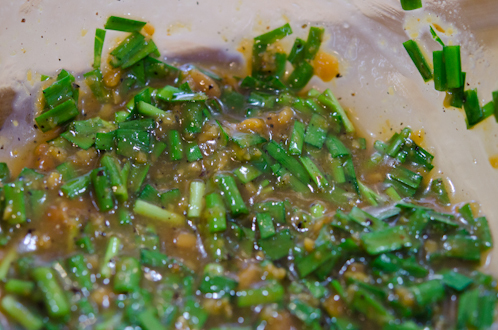 Add the chopped chives and mix well. Dump your pigs in and toss all together with your hand so that the meat gets covered with the sauce evenly. Hint: If you take out the meat (thawed) from the fridge just before you toss in, you will want to let this mixture sit for 10-15 minutes so the meat can come up to a room temperature. Meanwhile, preheat your broiler in the oven. 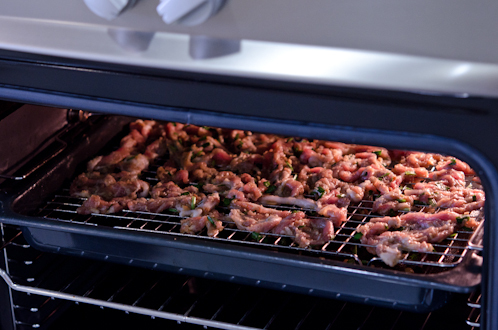 Place a cookie rack over your pan and spray with grease so the meat won’t stick to the rack. Spread your meat whatever way they let you. Place your pan in the oven about 3-4″ below your heat source. Set the timer for 6 minutes. You need to check often to make sure you don’t burn them. ADJUST the time according to your oven. After about 6 minutes, flip the meat to the other side so they cook evenly. Broil for another 5-6 minutes. When you see the edges of the meat gets browned and crisp, they are done. You can eat them alone with some rice but try pairing with this side dish below. 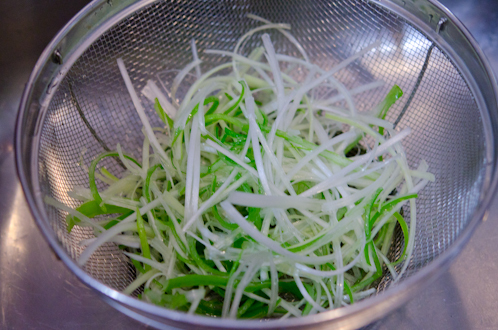 Here is an optional side dish you can serve with, a spicy Asian leek salad. 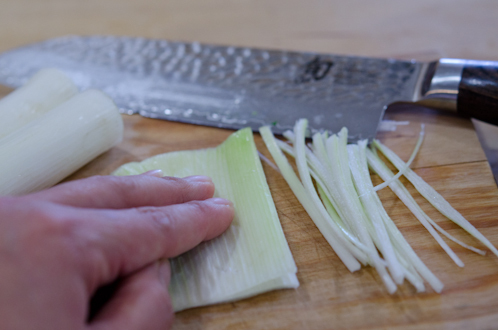 Cut Asian leek into 3″ long and give a slit on one side to remove the cores. Note: Asian leek is far tender than regular leek. If you can’t find them, substitute with green onion and slice them diagonally very thin. 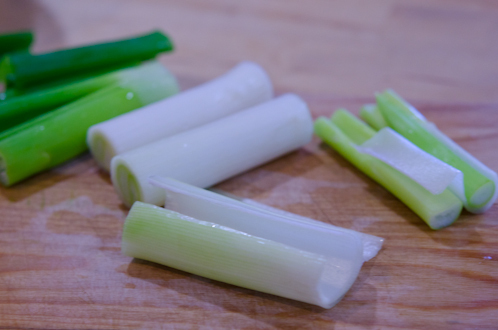 Flatten the leek pieces and slice into very thin (1/8″) matchsticks. You will need a very sharp knife to slice them thinly. Soak them in ice cold water with 1 tsp vinegar for 10 minutes or longer. This will add crispness to the leek. Combine the dressing ingredients and mix well. Take them out of water and drain thoroughly. 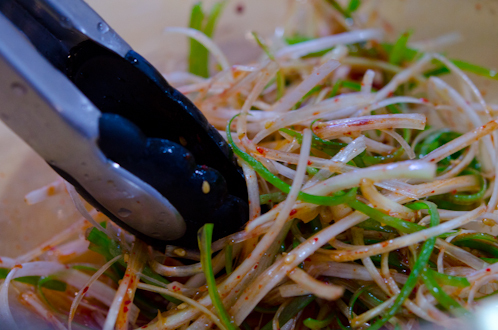 Use chopsticks or a tong to toss briefly together with the dressing. DO NOT use your hand. The very first Korean vegetable in my blog that I am telling you NOT to mix by hand! This salad needs to be tossed together just before serving. They get soggy soon. Do you have some royal blood in you? Do you deserve this dish? Although mine is diluted to 0.0001% over the past few thousand years. and my people call me, “your highness”. That’s good enough to deserve this majestic pork. Preheat your broiler. Bring your pork to a room temperature. In a mixing bowl, combine the rest of ingredients. Add the pork and mix with your hand so that the pork gets seasoned evenly. 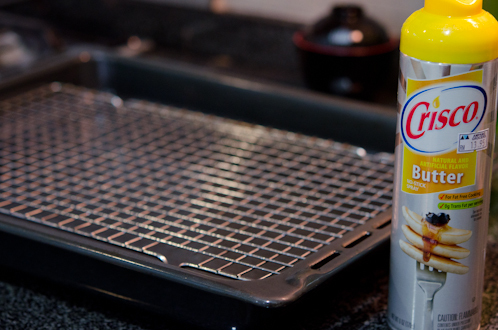 Spray a rack (such as cookie rack) with oil and place on a broiler pan. Spread the meat evenly in single layer. You might need to do this in two batches. Place the rack in the oven about 3-4” below the heat source. Broil for about 6 minutes or so. Turn the meat over and broil another 4-5 minutes or until the edges gets nicely browned. Make sure you watch closely to not to burn them. 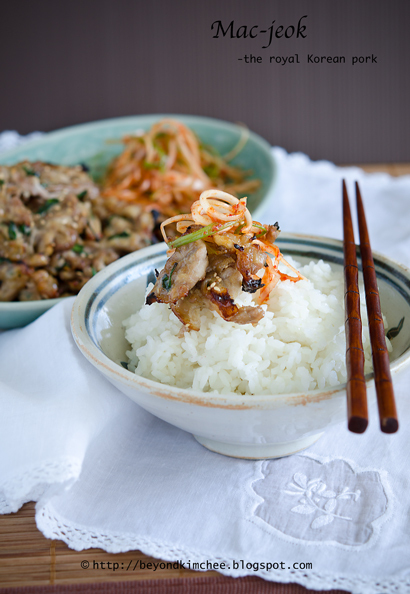 Serve hot with rice and Korean leek salad as you wish. 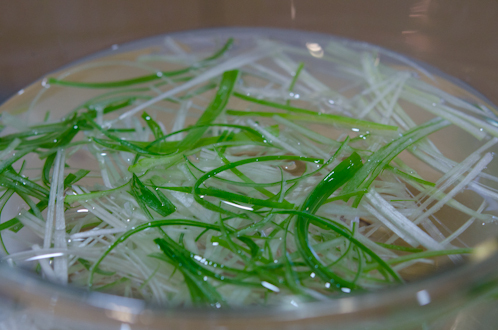 Soak leek slices in the cold water with 1 teaspoon vinegar for 10 minutes. Drain well. 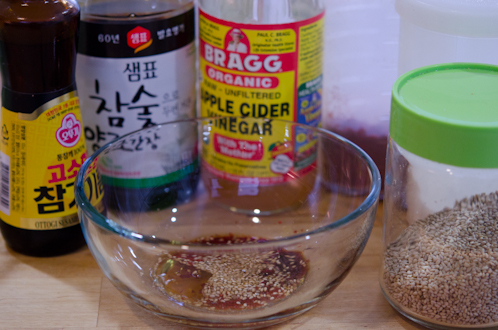 In a mixing bowl combine Korean chili flakes, soy sauce, sugar vinegar, sesame oil and sesame seeds. Add the leek and toss gently with chopsticks or a kitchen tong. « Tofu Broccoli Salad; simple, healthy, and yes, it’s delicious! Ha! I watched the series in Europe and I became glued to the tv set. It's so interesting, soaps with modern subjects have nothing on it! I think we need to get some of those fermented soya paste in our kitchen at home, thanks ! This looks unbelievably good indeed! I can't wait to make this! Thanks for posting this great recipe and mentioning that Korean drama..that's definitely something I would enjoy watching too. Nice blog, looks so delicious, i found that there is one website offering free puzzle games. Just take one minute to sign up then you will receive one free puzzle game. Its URL is http://www.684899.com/en/CosmicCreature/project_1.htm Click the below button of the page to get in. I've done it and now i am enjoying it. Would you like one? You know, I'm also a Korean 100% inside and out. And I never watch Korean drama and can't get Korean pop singers straight. You watch one, you've watched them all, and as for the talents...heck they all look the same to me. Anyway, Dae Jang Geum is one show I watched AND loved. Rare for me too, but it's a jewel in the drama industry. And I love this recipe...love the way you cooked it! That's really smart. And what do you know...I have all the ingredients I need except the pork! I don't have much space left in my fridge for other sauces, one level is full of Thai curry pastes, gochujang, miso, etc. How different is doenjang from Japanese miso? 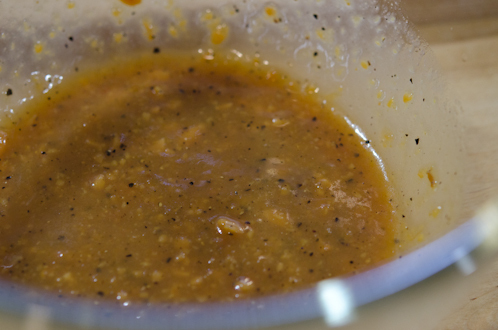 Doenjang paste is somewhat different than miso. It is more pungent and yield stronger in flavor. Miso is milder and slightly sweet. You can try this recipe with miso, it will work but slightly different in taste. The drama itself is quite long to finish but you will learn a lot about Korean cuisine and the Palace life. The story is very uplifting, too. I loved it. Yes, I like to watch dramas or movies with good values and lessons, yet still entertaining. Daejanngum - this is the K-series that sparks my interest in Korean food! :) Tks for the recipe. Will definitely try it! 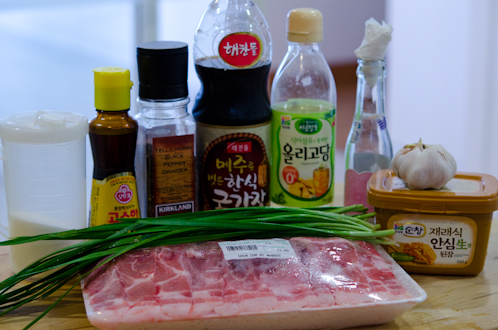 Your blog makes me miss Korea so much...I cannot wait to try making this dish! I love Korean food! :) Thank you for sharing! Hi, I see you have a nice blog. Submit it for "Blogomania : The Bloggers' Paradise" and win cash prizes along with a chance to get published. This looks fantastic! I have two questions about potential substitutions (I can get the Korean ingredients at a local market, but if there's a way to use items I already have, that's always good)... For the Korean soy sauce, is substituting a Chinese soy sauce possible? Or are these very different? And similarly, for the Doenjang paste, is this similar (it looks similar) to a Chinese brown-bean paste? Many thanks, and looking forward to trying this recipe! 한국음식을 이렇게 멋지게 소개해 주시다니요! 20년이 되었는데 한국음식은 제대로 배워본적도 없고 자신도 없었어요. hehe a few years back I was one of those giggly teenage girls crazy about following every episode of her favourite korean drama! this looks like one yummy recipe! I believe there are several types of Chinese bean paste. If they are made of soy, it will work. However you need to adjust the amount since their saltiness varies. For the Korean soy sauce substitute, unfortunately the Chinese soy sauce can't replace. They are quite different. Instead use fish sauce if you have. But use less amount sine fish sauce is far saltier than Korean soy sauce for soup. 좋은 글 남겨주셔서 감사합니다. Sugar crafter 일 늘 관심은 있었지만 한번도 도전해 본적이 없어요. 참 흥미로울것 같아요. 가끔 한국음식 만들어 보시면 금장 익숙해지실거여요. 감사합니다. Korean foods that are not so popular also look like delicious! This looks pretty incredible. I'll have to try to do something like this sometime. I thoroughly enjoyed reading your blog posts and your recipes. I found them very witty and interesting. I must confess, they got me laughing for a little while and I sensed the familiar sense of humour. Thanks for dropping by my blog the other day and I really appreciated your comment. It cheered me up a lot. I think I'll most definitely come here again whenever I miss home. It seems close enough. Looks like a hearty dish...I am so intrigued with this Jewel in the Palace story that you have mentioned. I am searching for it, looks like a nice story. Is this a published novel? Wanna try and check Amazon. But i am trying your dish first...Thanks! I made this last night and it was DELISH!! My husband said KBBQ at home? Why yes I can't wait to try some more of your dished out!! Thank you for the great Korean recipes. I just found your site and I can't wait to try some of the recipes. I am half Korean living in California, but my Korean mommy lives in Washington, so I get home sick for her cooking alot. I try to make the same dishes she always made for me, but they don't compare to mom's. It's good to see that more people are enjoying the delicious Korean dishes more and more. My favorite is still kimchee with egg & bacon in the morning. I will be trying this tonight. There are two types of cultures that top my list when it comes to food: Korean and Lao. I went to Daegu in 2005 and fell in love with the country, city and culture. My husband is Lao, but I am working hard to learn more about their food and culture as well. Thanks so much for the recipe! Hope you and your husband will enjoy the pork. Daegu is a wonderful city to visit in Korea. I am glad that you enjoyed your time there. Hi Clare I am glad to hear that you liked it. I often make this Mac-jeok and everyone whom I served this dish loved it. Hope you can get the Korean soy sauce for soup soon. I use that sauce quite often for many dishes. Thank you so much for this recipe! There is a sweet young Korean missionary girl in town who is feeling homesick. Tonight I made her this dish as well as green onion pancake ( it was a rainy day so told my children the story of Blue) and sweet potato doughnut. I even tried my hand at deok! She was thrilled, and said that everything tasted just like home. Though she was surprised to see me making the red bean paste for the deok from scratch. So thank you for helping me brighten her day. Wow, Jennin I am so impressed. Not only because you have prepared all these wonderful Korean food yourself but your tender caring character to cheer up a young Korean girl by making all the dishes for her. What a giving person you are! Thank you so much for your effort. I am sure she will remember your compassionate service throughout her life. Thanks for the great example. It is my honor being part of your service (by providing the recipe, ha ha!). 1. SO fun to have a recipe from Dae Jang Geum to make! I just watched the episode with the Mack-Jeok recently so this was extra cool! 2. It was delicious and easy to put together. 3. The Washington Post Wellness column had a feature yesterday on fermented foods and their health benefits. http://www.washingtonpost.com/blogs/on-parenting/post/fermented-foods-bubble-with-healthful-benefits/2012/11/19/db70ea76-329b-11e2-9cfa-e41bac906cc9_blog.html Obviously Korean cuisine has a leg up in this area! Thanks Tamar for the article link. Yes, Korean cuisine has so much to offer with fermented food. I am glad that you found this post. Thank you for this recipe! It was so easy to make and the taste was wonderful. I had never tried doenjang before, but it had a great flavor. This looks absolutely delicious! Can you tell me if the soybean paste is gluten free? Authentic soybean paste should not have any gluten. However I am not 100% sure how commercially made paste is. I know some brands add wheat to get the thick consistency. So I would recommend to check the ingredient label on the back to make sure it is wheat(gluten) free. Look for organic paste. Hi - this looks delicious!!! I have all the ingredients except the Korean corn syrup - can i skip it and still be able to make this recipe or is that anything I can substitute the corm syrup with? Thanks. Hi Casey, you can skip the corn syrup. I often do without it. The corn syrup adds a little lust and more sweetness to the dish. Hope you like this recipe. 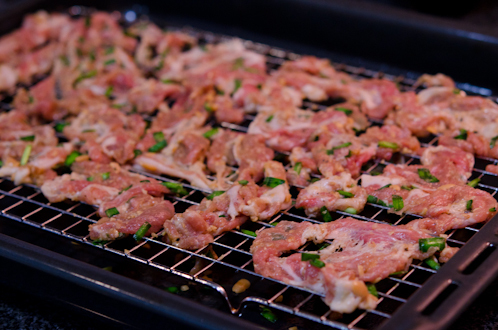 It is one of my favorite way of cooking Korean pork! Happy cooking! Honestly one of the best recipes here. I make it regularly. Thank you!